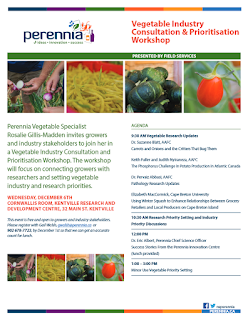 We are proud to be hosting a Vegetable Industry Consultation and Prioritisation Workshop on Wednesday December 6th at the Kentville Research Station from 9:30 to 3 pm (lunch included). The morning will start off with some research updates, followed by discussions about the priorities of the vegetable industry as well as research needs. An online survey has been recently sent out through Horticulture Nova Scotia to identify Vegetable Research Priorities, you can add your priorities by clicking here. Your participation is essential to identifying industry research needs and your time is greatly appreciated. All private information will be kept confidential. After lunch, we will do the annual Vegetable Minor Use Priority Setting. Please email Gail Walsh to register, or call 902 678-7722 so that we can get a headcount for lunch.